Safe footing should be the goal with any foot covering that you sew. When you sew slippers, booties or pajamas with feet, sew non-skid or no-slip type fabric on the sole to prevent slipping and sliding on carpets and floors. For many years there was only one type of no-slip fabric available. Recent developments has made more options available. Experiment and learn about the various options before you buy slip resistant fabric for the soles of slippers and pajamas. 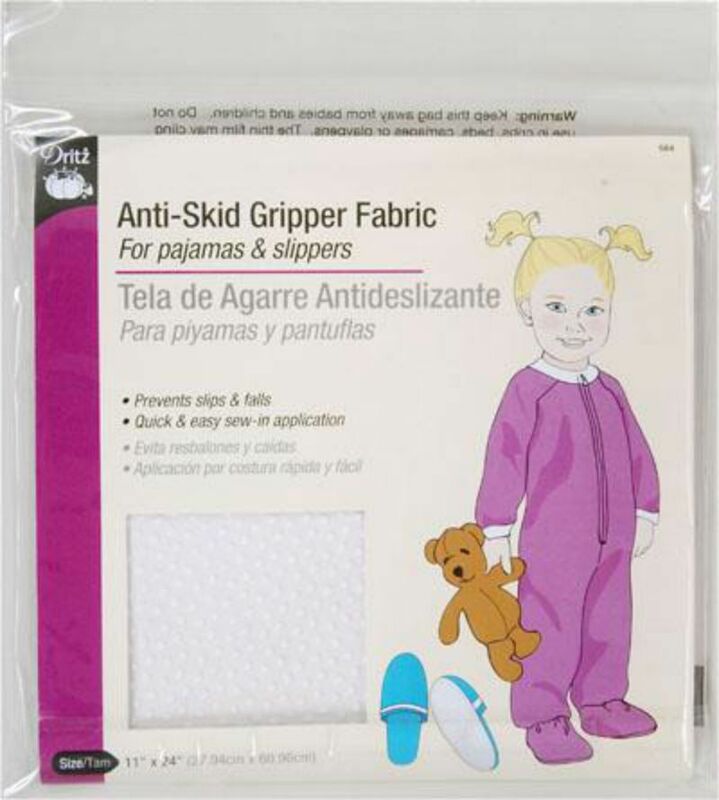 Jiffy Grip is the most commonly recognized fabric for soles of footy pajamas and slipper soles. The flannel backed fabric is coated with no-slip dots which help prevent skidding of slippery floors. Of the slipper sole fabrics shown here, this fabric is the thickest and firmest of the three. The footprints of no-slip coating provides a very slip-resistant surface. I strongly recommend this no-slip fabric for anyone who is handy capped or at risk for falling. The basic fabric is an cream color, with the printed footprints,being available in white, gray,navy,purple,royal,forest and red. This fabric is very similar to the most commonly found non-skid fabric. It is a flannel backed fabric coated with no-skid white dots. It does seem to be a bit heavier fabric but above all it is definitely a comparable, quality product.